Make cupcakes from scratch with this easy vanilla cupcake recipe. Especially light and moist, these delicious cupcakes are better than anything you could buy at the store. Vanilla cupcakes can be used to make many different desserts. They can be paired with a multitude of frostings and decorated to suit any occasion. Served with fresh fruit, chocolate sauce or warmed preserves, they make a delightful quick and easy dessert. We have included an easy buttercream frosting recipe that can be used to frost the vanilla cupcakes. The frosting can be used as is or can be tinted with food coloring. 1. Preheat oven to 350 degrees. Line 12 muffin cups with paper or foil liners. 2. In a medium bowl whisk together the flour, baking powder, and salt. Set aside. 3. In a large bowl, with mixer on medium speed, beat the butter and sugar until light and fluffy. Add the eggs, one at a time, beating well after each addition. Beat in the vanilla extract. With the mixer on low speed, alternately add the flour mixture and milk, beginning and ending with the flour. Scrape down the sides of the bowl as needed. Evenly fill the muffin cups two-thirds full with the batter. 4. 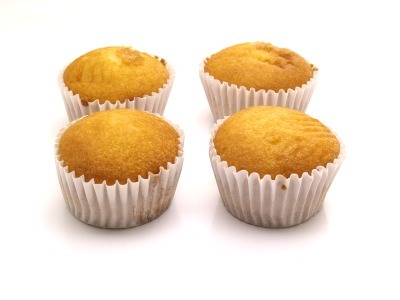 Bake for 18 to 20 minutes or until a toothpick inserted into the center of a cupcake comes out clean. Remove from oven and place cupcakes on a wire rack to cool. 5. To make the Frosting, in a medium bowl, with mixer on medium speed, cream the butter until smooth. Add the vanilla extract and mix well. With the mixer on low speed, gradually beat in the powdered sugar, occasionally scraping down the sides of the bowl. Add the milk and beat on high speed until frosting is light and fluffy. If the frosting is too thick, add a little more milk. If the frosting is too thin, add a little more powdered sugar, until right consistency. 6. Tint the frosting with food coloring, if desired. To tint the frosting, add food coloring one drop at a time, mixing well after each addition, until the desired color is reached. Frost the cooled cupcakes.